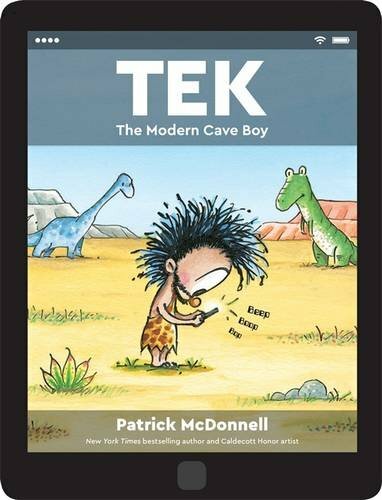 Summary: Young Tek lives in the Stone Age, but wants nothing so much as to stay in his cave, playing with his tablet, phone, and game box. Prehistoric friends come to visit, but he refuses to go outside and play with him. The Ice Age and evolution are going on around him, but Tek is oblivious. Finally Big Poppa, the village volcano, decides it may be time for an eruption intervention. Thankfully, this dislodges Tek from his cave, and forces him into the great outdoors. Disconnected at last, the boy discovers the beautiful world around him and enjoys a day and night playing outside with his friends. 40 pages; ages 4-8. Pros: With a cover designed to look like a tablet, this story is sure to resonate with kids everywhere. There’s plenty of humor to tickle the funny bones of the intended audience, both in the text and the illustrations of Caldecott honoree McDonnell. Cons: The “put down your electronics and get outside, kids” message was not exactly subtle.